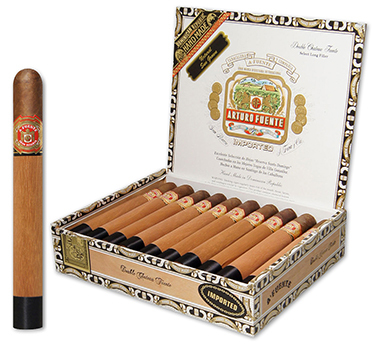 The Chateau Fuente line of premium handmade cigars was inspired by Chateau de la Fuente, the beautiful home of the world renowned Arturo Fuente tobacco plantation. Each unique creation within the Chateau Fuente line is masterfully blended from the Fuente family's private reserve of aged tobacco and rolled to the perfect shape and size to complement each blend. Chateau Fuente cigars are smooth, creamy, and flavorful mild to medium-bodied smokes that are beautifully constructed with an excellent burn. Several sizes are available with the option of a silky Connecticut Shade Natural wrapper, a robust Ecuadorian Sun Grown wrapper, or the slightly sweet Connecticut Broadleaf Maduro wrapper, and all are aged to perfection before being individually wrapped in their signature cedar sleeve.